Photographs are an important part of recording a war memorial. They provide a record of the memorial’s condition and help to identify conservation and repair issues. These guidelines will assist you in ensuring that the photographs you take are of a suitable format and quality. 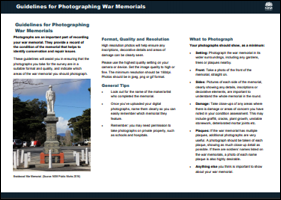 Download our full guide to photographing war memorials. Please use the highest quality setting on your camera or device. Set the image quality to high or fine. The minimum resolution should be 150dpi. Photos should be in jpeg, png or gif format. Photos must be less than 8MB but as large and clear as possible. The image size of photos that you upload should be at least 2 Megapixels in size, or approximately 1600 × 1200 pixels. When possible, shoot with your back to the sun, as opposed to facing towards the sun; this will avoid potential overexposure and lens flare. If you are taking a photo of a memorial in a glass cabinet, such as a Roll of Honour, avoid using the camera flash or take the photo from a slight angle in order to minimise reflections. Setting: Take a photo of the war memorial in its wider surroundings, including any gardens, trees or plaques nearby. Front: Take a photo of the front of the memorial, straight on. Sides: Take a photo of each side of the memorial, clearly showing any details, inscriptions or decorative elements. Damage: Take close-up photos of any area/s where there is damage or areas of concern. This may include graffiti, cracks, plant growth, unstable stonework, deteriorated mortar joints etc. Plaques: A photograph should be taken of each plaque, showing as much close-up detail as possible. If there are veterans’ names listed on the war memorial, please take a photo of these plaques, showing as much detail as possible. Anything else you think is important to show about the war memorial.